Nanolytics Instruments carries a variety of AUC (Analytical Ultracentrifugation) measurement cells. All of them feature titanium as a material for the centerpieces. Titanium is know to be inert to a wide scope of solvents, to be mechanically stable and to exhibit excellent surface smoothness and can be run up to 60,000 rpm. All dimensions are identical to other commercially available cells and centerpieces. However, our housings have metric threads for the benefit of more revolutions in the thread and more sensitive response when tightening. 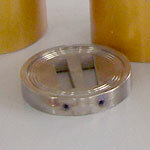 Nanolytics Instruments offers modified window holders. These are familiar from the Model E where they were mandatory for the interference system. Though modern interference optics will work with standard window holders (with rectangular cutout), they have the benefit of blocking stray light, yielding better interferograms to some extent. However, they cannot be used with standard absorbance optics. 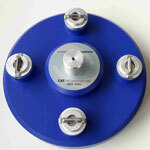 Perfect alignment of measurement cells within the rotor can be achieved with Nanolytics Instruments' alignment stand. Four- and eight-hole-rotors are placed on the stand, and blades will snap into place when the cells are turned into the correct position.Alignment error will be below 0.1° if this tool is used. 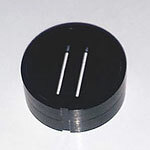 The tool requires the cells to be equipped with bottom notches for the blades, as is the case for all cell housings provided by Nanolytics Instruments.